There are three types of signals (AM, USB, LSB) presently used for communications in the CB (Citizens Band) radio and the Galaxy DX949 can transmit and receive all 3. When the MODE switch on your DX949 is in the AM position, only standard double-sideband, full carrier signals will be detected. The USB and LSB modes will detect upper sideband and lower sideband respectively, and standard AM signals. Galaxy's DX949 CB Radio w/Talkback Circuit is like the Galaxy DX959 without the Frequency display. The DX949 CB Radio is packed with Galaxy's special features like the Roger Beep which indicates when the Mic button is released. CB Radios are every Truckers friend. What better way to pass the time away then by talking with fellow Truckers. 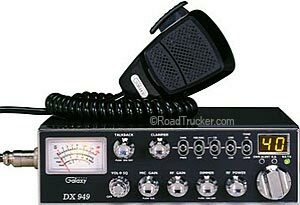 This Galaxy CB Radio is great for emergency situations or trouble ahead!